In HIV, one of the issues is that the virus can become dormant, they cease to replicate, and remain for all intents and purposes hidden and inactivated in a small pool of resting CD4+ T-cells. The problem with this is that the anti-retroviral drugs we have work by interfering with replication, thus if viruses aren’t actively replicating, they’re not exposed to the drug. Likewise, in chronic bacterial infections there exists a phenomenon called ‘persistence’. In a bacterial population a sub-population of ‘persister’ cells continue to exist in a stationary or growth-retarded state, regardless of the growth state of the population as a whole. Whilst there are ongoing arguments in the field about what constitutes ‘persistence’ and the genetic or environmental factors that result in such dormancy, it is none the less the case that most antibiotics have been developed to attack actively growing cells. In the absence of growth, the bacteria are simply not effected by the antibiotic. In both HIV and chronic bacterial infections, removal of the chemotherapy can result in a significant flare-up of the infection as a result of re-activation of the dormant virus/bacteria. So how do we address these issues? Well, an approach adopted my many HIV/antibiotic research labs is to screen such latent cells/persisters against libraries of different types and shapes of drug molecules. The aim is to identify drug molecules that re-activate the cells, thus forcing the ‘sleepers’ back out into the open where they can be targeted by chemotherapy. 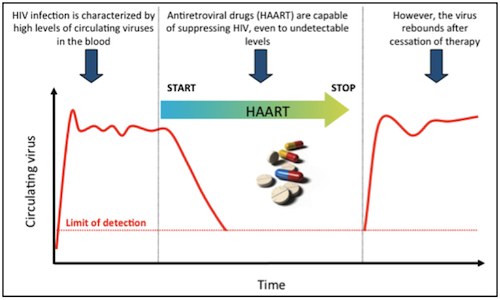 In HIV research circles there has been some work developing two potential approaches. Interleukin-7, a naturally occurring signalling molecule, has shown some signs it can re-activate dormant cells, and thus HIV. The other approach is looking at several histone deacetylase inhibitors, which can reactivate HIV directly. However, one of several major issues has been that it isn’t much good flushing out the sleepers if there are still parts of the body where infected tissues can avoid exposure to such drugs; we’d need to know the extent of such reservoir tissues and how to target them. In the case of treating bacterial persisters, a recent study demonstrates exactly the sort of prudent, rational approach that can be taken to addressing this issue. The study from the lab of Prof. Jim Collins at Boston University, focussed on targeting both E. coli and S. aureus persister cells with an aminoglycoside antibiotic called gentamicin. Aminoglycosides are a group of drug molecules that interfere with protein synthesis, an essential living process, but they can only work if they can actually get into the cell. It’s well known that the process of aminogylcoside uptake by the cell is energy-driven, however, being metabolically dormant the persister cells have insufficient energy for drug uptake and so gentamicin has only weak activity. Prof. Collins team found that treating persister cells with certain sugars (glucose, fructose, and mannitol) induced rapid-killing when gentamicin was present, and so seemingly the idea of metabolically stimulating such dormant cells hold true. The addition of sugars doesn’t exactly turn these cells into native active cells, because this treatment only works to enable aminoglycoside-mediated killing. Other classes of antibiotics still had no effect. Sugars such as glucose, fructose and mannitol enter a cell’s metabolism at the head of a process that generates high-energy molecules. Whilst this energisation is enough to enable aminoglycoside uptake, it’s not enough to get all the cellular processes ticking over, hence the lack of reaction to antibiotic drug classes that target other cellular processes. What is interesting is that the process works for both Gram-negative bacteria (such as E. coli) and Gram-positive bacteria ( S. aureus ), both representing a broad divide in the bacterial world, though in S. aureus only the fructose, rather than glucose and mannitol, resulted in rapid killing by gentamicin. In our spy novel we might say that the enemy sleeper agent is being lured out into the open by a sugar coated package, the contents of which spell the agent’s death. But certainly approaches such as these can only benefit the increasingly complex requirements of antibacterial chemotherapy that are required to treat persistent infections. Previous Post Where I am quoted not quite correctly….